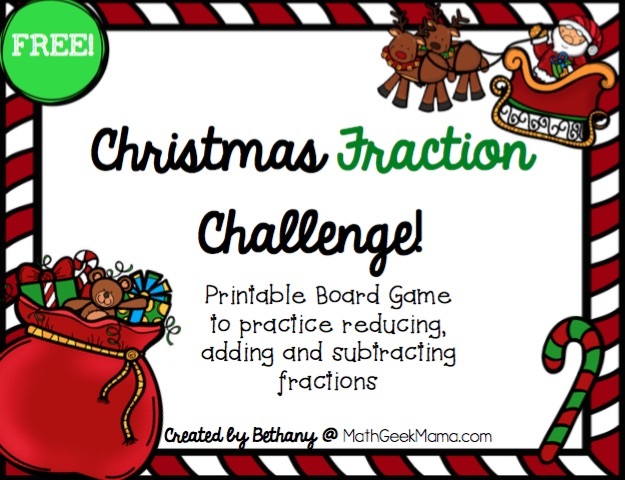 Today I’m continuing my series of Christmas math freebies with another fun fraction challenge! 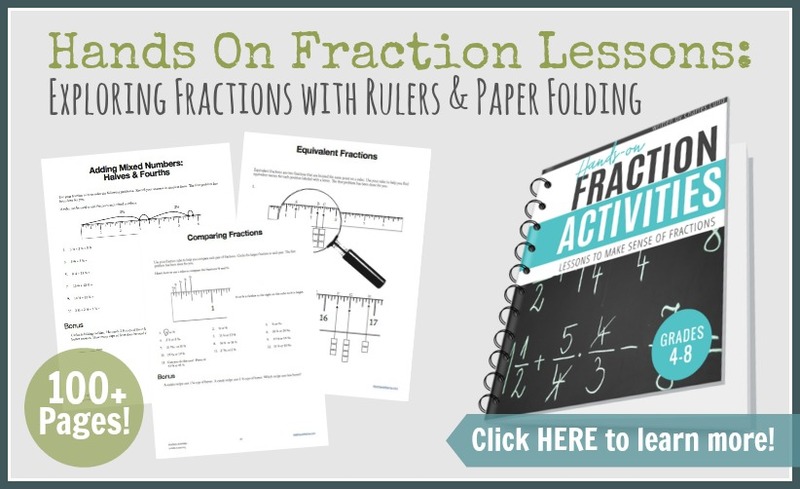 Working with and understanding fractions can be so hard, but it doesn’t have to be boring. 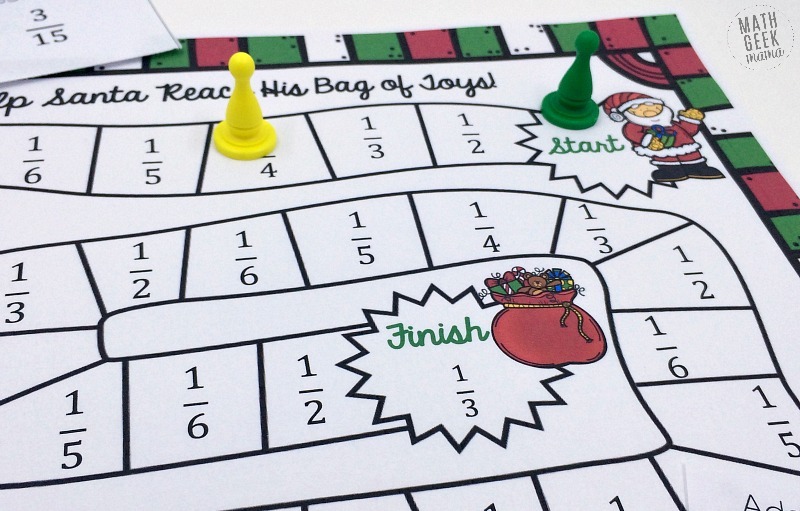 This printable fraction game will get your kids in the Christmas spirit, and give them an opportunity to practice operations with fractions at the same time. 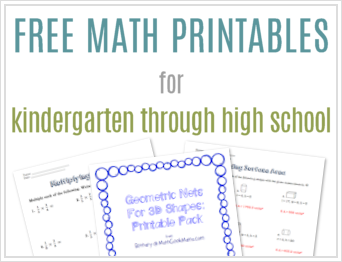 It’s perfect for kids who are ready to simplify, add and subtract fractions. This game is fairly straightforward, and includes everything you need to play except some game pieces. You can use anything you have lying around, such as pieces from a board game, coins, unifix cubes, beads, etc. To set it up, simply print the game board and game cards. 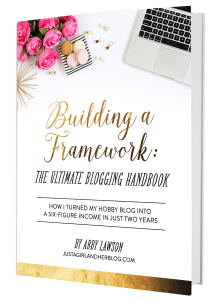 I highly suggest you print on card stock for durability and so that the cards will not be see through. You may even want to laminate the pages for added durability, especially if you plan to use the game again in the future. Then, cut out all the game cards, mix them together and place them in a pile face down. Each player begins with their game piece on start. The first player then draws a card and solves the math problem (problem cards cover reducing fractions as well as adding and subtracting fractions with like denominators). The player then moves to the closest space on the game board with that solution (similar to Candy Land). The possible solutions in this game are 1/2, 1/3, 1/4, 1/5, or 1/6. It is then the next player’s turn. They draw and card and play in the same way. Play continues in this way until someone reaches the “Finish” square (by solving a problem with a solution of 1/3). First player to reach “Finish” wins! 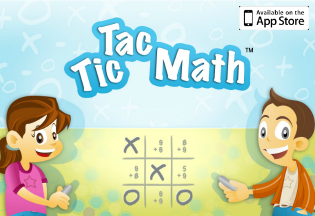 Please note, this game includes 12 simplifying problems and 12 addition/subtraction problems. If you only want to work on one of these skills, just print out the page of game cards you would like to focus on. I would suggest, however, that you print two copies of them so that you have plenty of cards and aren’t constantly reshuffling. If you make it through the entire deck of cards and no one has won, just reshuffle, turn them over and start going through them again. As I mentioned yesterday, the more kids are exposed to fractions and have opportunities to play and explore, the more familiar and comfortable they will become. 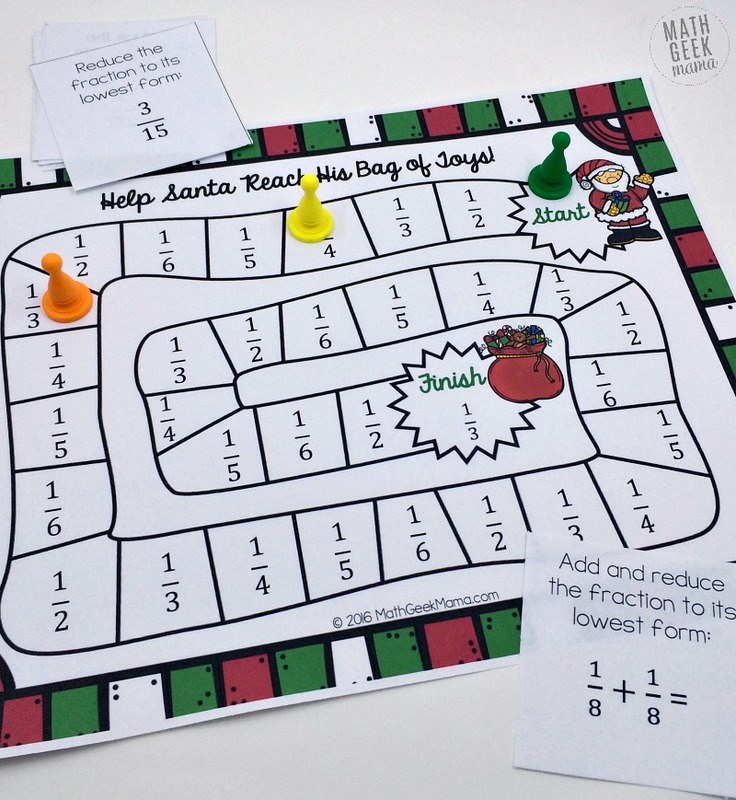 By playing this game, kids will practice several important math skills, but will also begin to recognize common equivalent fractions. This will help them to compute with ease and confidence, and they won’t even realize it because they’ll be playing a game. Plus, the more they interact with fractions and equivalent fractions, the greater their number sense as they start to recognize patterns through play and repetition. 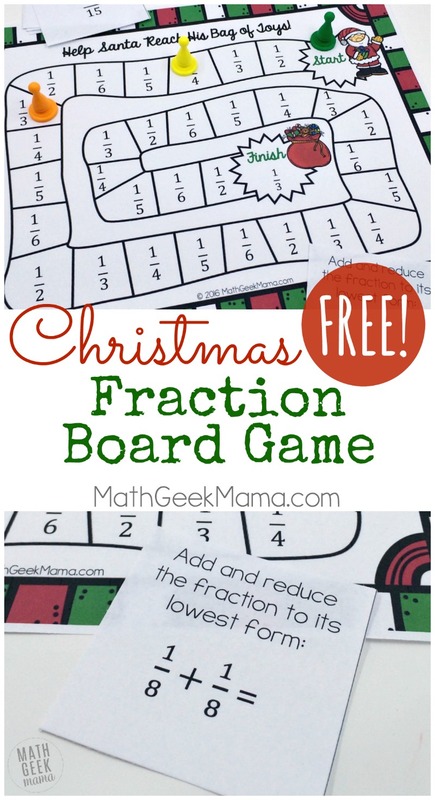 So I hope your kids enjoy this printable fraction game, and find it a fun way to practice fraction operations this Christmas season! 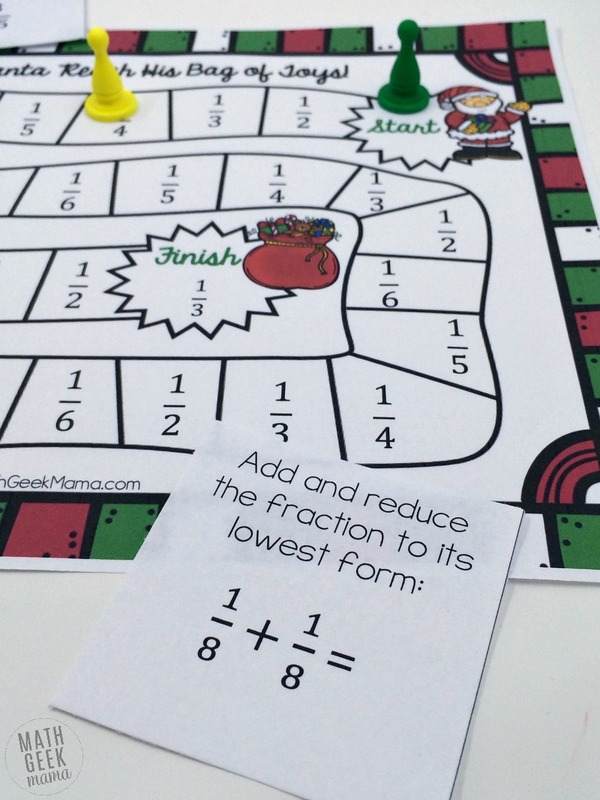 Want more fun fraction games and resources? Try one of these! 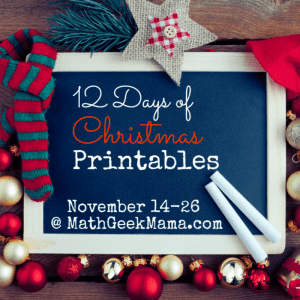 And of course, don’t miss the rest of the “12 Days of Christmas” math printable series!